When you grow up in a Hispanic household, beans are undoubtedly one of your comfort foods. I still love the smell of a big pot of “frijoles a la charra” simmering on the stove top (“frijoles a la charra,” which translates to cowboy style beans or drunken beans, is a pinto bean soup simmered with onion, tomato, serrano chiles, and sometimes, beer). While absolutely delicious and comforting, that’s pretty much the only way my mother served beans. Unless you count refried frijoles a la charra which she may have prepped for breakfast. I hate to mess with a great thing, but I don’t think my mama would mind my taking beans in a different but still Mexican-inspired direction. 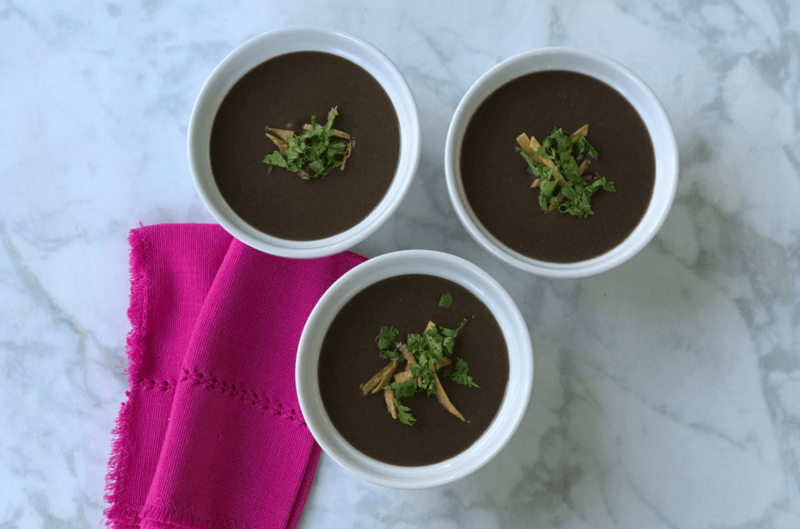 For one, I start with black beans (do soak them overnight), and add tons of flavor by blending the beans with sautéed onions and garlic plus the real kicker – chipotle peppers in adobo sauce. Sean is obsessed with the flavor of these peppers, which I also use in one of my famous (amongst my family and friends) salsa recipes. Find the chipotle peppers in a small can in the global section of your grocery store. Garnish with avocado, cilantro and for a little crunch, some fried corn tortilla ribbons. You might also add a sprinkle of cotija cheese for a nice contrast. 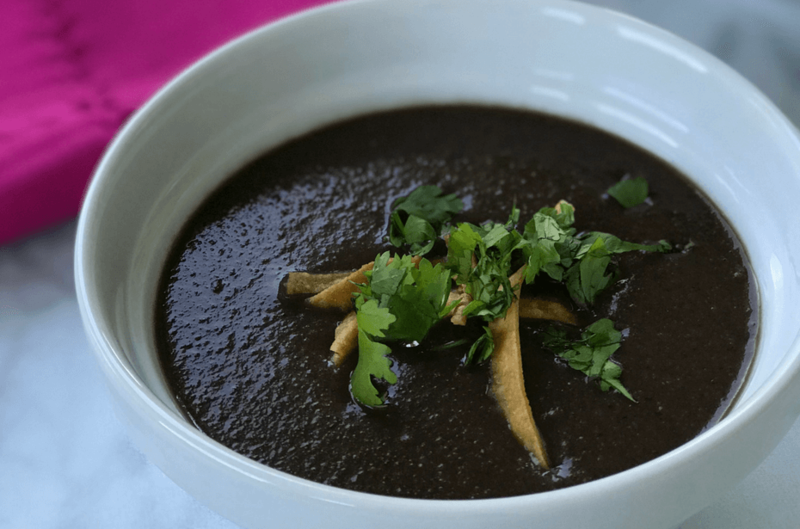 High in fiber and protein so you’ll stay fuller longer and a great source of iron, magnesium, selenium, thiamin, folate and calcium, this vegan bean soup is a big bowl of nutrition. And it’s so easy to prep and delicious, you and your kids might even call it comforting. After soaking the beans overnight, rinse and place in a stockpot. Fill with water until there are about 3-4 inches of water covering the beans. Add ¼ of the onion, 4 heads of garlic and salt. Bring to a boil, then reduce heat to low. Cook covered for about 3 hours, until beans are al dente. Heat oil in a sauté pan, and sauté the onion on medium high, until softened, about 3-5 minutes. Add the garlic and sauté for another 1-2 minutes. In a Vitamix or food processor, blend the cooked beans and cooking liquid (add a little at a time until you have desired consistency), onion/garlic mix and chipotle peppers in two separate batches. 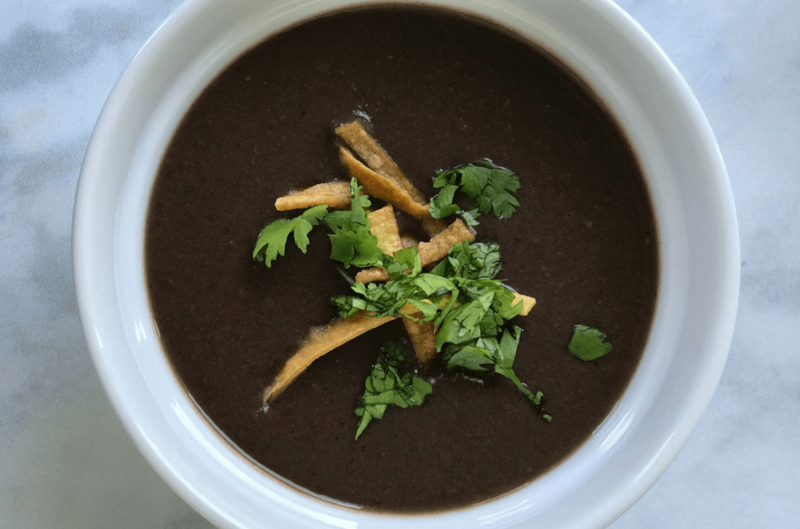 Heat in a saute pan and serve immediately with cilantro, avocado and tortilla strips as garnish. The soup tends to thicken in the fridge. Save some of the cooking liquid in case you need to blend some in later.